Summer time and the season is upon us! Hello, everyone! I hope you are enjoying this time of year as much as I am. What a delight it is to be bathed in long days of sunlight, gentle rains (and the occasional downpour), too many cultural events to choose from, and the sheer enjoyment of seeing friends out and about! 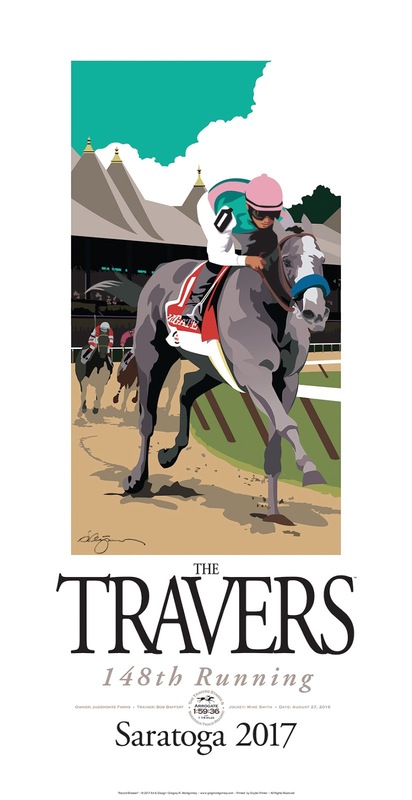 We kicked off the season in mid-June with the release of this year’s Travers/Saratoga poster — “Record Breaker!” We just had to show Arrogate, last year’s Travers winner, bursting from the poster frame in front of the famous Saratoga grandstand, thirteen-and-a-half lengths ahead of his rivals. There’s an added feature that shows the record-setting time, distance, and racing team. Truly a day for the record books! Hope to see you on our travels!